For the intraperitoneal onlay mesh technique in hernia surgery. Optimal handling in laparoscopic and open techniques. Green marker thread in the craniocaudal direction attached to the parietal (PP) side. DynaMesh®-IPOM is a dual-component structure specifically developed for the IPOM technique; it is composed 88% of high purity PVDF and 12% of polypropylene (PP). The parietal side (PP) promotes rapid and safe ingrowth into the abdominal wall. The PVDF layer on the visceral side forms a barrier to the intestines. PVDF demonstrably decreases the risks of adhesions compared with polypropylene  and thus reduces the risk of intestinal erosions. If implantation of several meshes is required (as in the sandwich technique, for example  ), the open-pore structure means that implants can easily be overlapped. The parietal side (PP component) has a green marker thread and must face the abdominal wall. The marker thread is located on the front surface and simultaneously shows the correct direction of the elasticity in the craniocaudal direction. 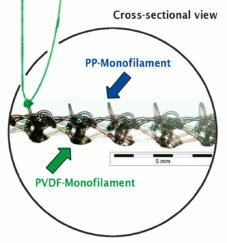 The textile implant can easily be cut to size extracorporeally and provided with more fixation threads. 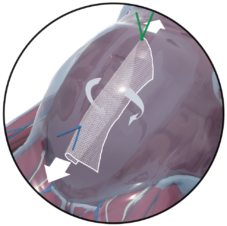 DynaMesh®-IPOM facilitates intraoperative handling by offering very high transparency. The high resilience and minimal roll-up tendency enable optimal handling and fold-free placement. 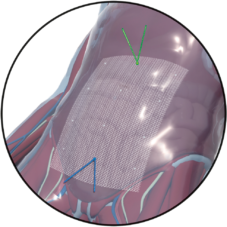 It is recommended that the mesh is attached under pre-tension to the abdominal wall while this is stretched during surgery. 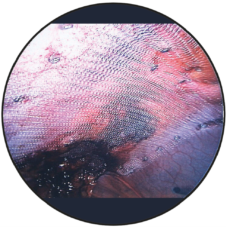 The open pore mesh construction facilitates the break-down of seroma, reduces scar plate formation and thus decreases postoperative pain. Minimal mesh shrinkage is achieved and long-term surgical success with high patient comfort ensured [9-14] through the open-pore and elastic mesh construction made from PVDF, which offers long-term stability. For repair of umbilical hernia with intraperitoneal mesh position.